In the middle of the night, I headed out to Golden Gate Canyon with a bunch of folks from my hiking club to hike Tremont Mountain and see the sunrise from the summit. We assembled in Boulder at 3:30am and drove about an hour up steep, windy roads, with several stops for car sickness, to the trail head. The weather was not good. It was raining on and off in Boulder, very cloudy with dense fog, and pretty cold. However, we made a go of it and when we got to the trail head the rain was done and the ground was more or less dry. We hiked off trail, bushwacked, and scrambled up for about an hour or so to tag the summit. 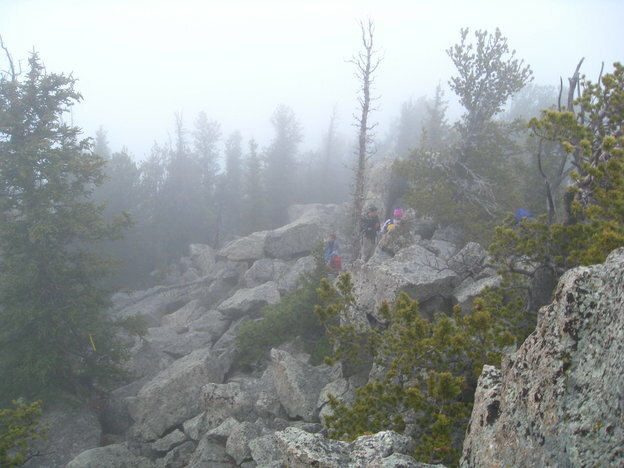 We were running a bit behind so we were too late to be on the summit for sunrise, but it was moot due to the clouds and fog. Normally you would be able to see all of Golden Gate Canyon and the Continental Divide, but our visibility was about 100 feet. We scrambled back down and had some yummy breakfast at the trail head of eggs, potatoes, peppers, and salsa along with tea, OJ, etc. It was about 37 degrees there and there was still patches of snow here and there on the mountain.